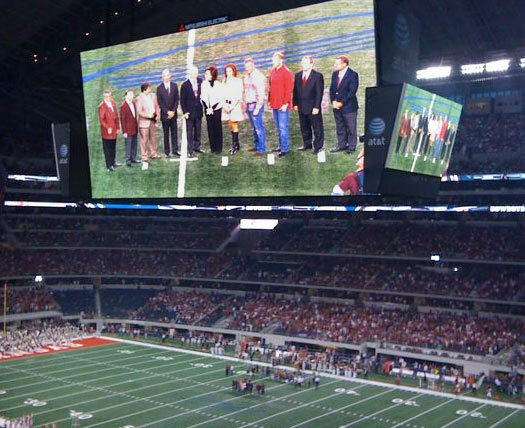 The presentation was made on the Cowboys Stadium field in front of more than 70,000 fans gathered for the Oct. 3 gridiron showdown between Texas A&M University and the University of Arkansas, Jones’ alma matter. Prior to the kickoff, stadium designer Bryan Trubey ‘83, design principal with HKS Architects and an Outstanding Alumnus of the college, presented the award to Jones. 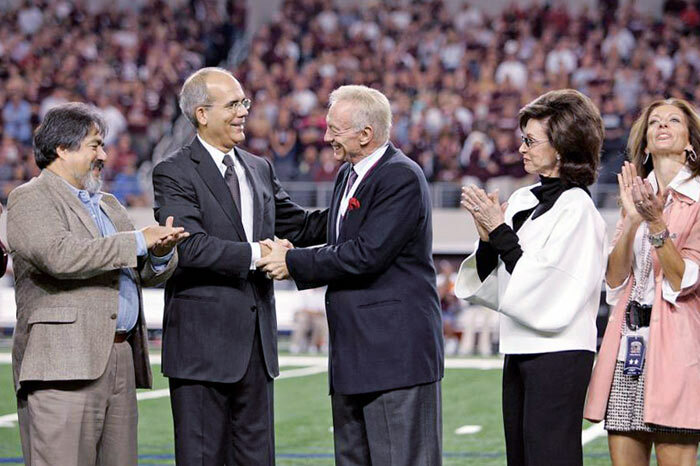 Joining Trubey and Jones on the field for the presentation were Jones’ family, Vanegas, Texas A&M Interim President R. Bowen Loftin, University of Arkansas Chancellor David Gearhart and athletic directors from both teams. Now that the Spirit of Place Award has been established, Vanegas said the Dean’s Advisory Council, in consultation with the college’s four departments, will determine the criteria for future Spirit of Place Award presentations. “The next medal will be awarded to someone, possibly an owner, designer or builder, that has made a place ‘happen’ that brings great enjoyment to people,” he said. 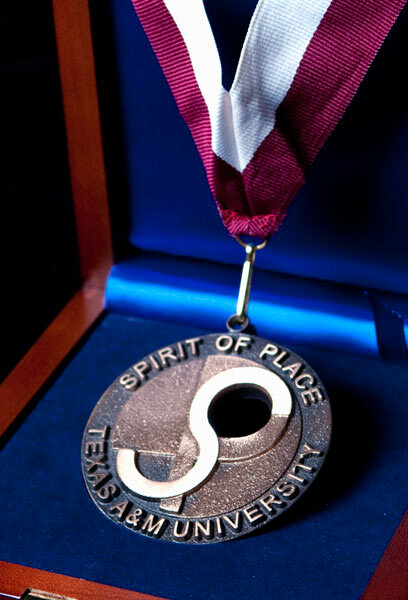 The medallion was designed by Rodney Hill, professor of architecture at Texas A&M. 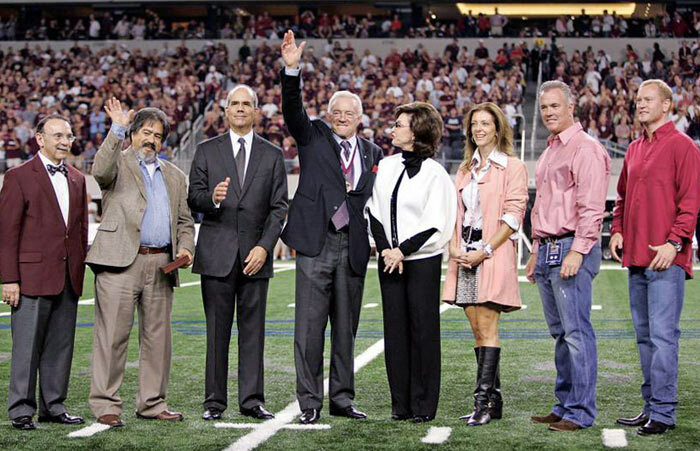 Hill has a long list of creative achievements, such as a 13-foot tall obelisk depicting the history of Arabic contributions to science presented to Texas A&M University at Qatar’s major benefactors. Other Hill creations include a series of carved wood murals made of 8-foot by 3-foot walnut panels depicting the history of Texas A&M, the ceremonial mace carried at university events, a bronze Muster sculpture in the Academic Plaza and an 8-foot-tall wood and bronze obelisk in the Sterling C. Evans Library.